My youngest daughter has an affection for cows! She likes to give them names! Shirley was the latest! A while ago I pinned this pattern with Bethany in mind! 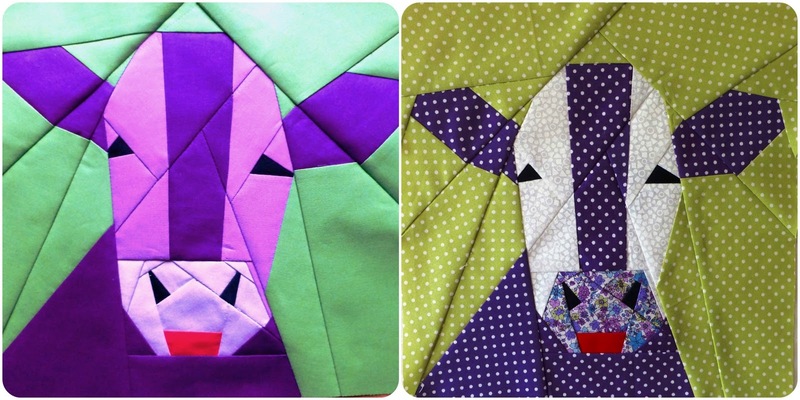 It is her birthday this month, so I thought I’d have a go at making her a cow cushion! I knew I wanted Shirley to be in purples and greens. My first attempt was sewing directly onto the print outs, but I didn’t have any solid fabrics at the time so went with polka dots! I didn’t think it looked quite right, too fussy! So I got some Klona from my LQS and had another crack at it. For my 2nd attempt I traced the pattern onto greaseproof paper, which is what I usually use for paper piecing. And I have to say, the klona pieced like a dream! Unfortunately, I lost some accuracy doing it this way (you can see that Shirley looks like she’s suffered a stroke as one side of her face is drooping!) and I made a mistake on the nose (can you spot it?). I don’t have the stomach for making a 3rd one, and think I will just go with Klona Shirley! What do you think? Previous Previous post: Mad May! Next Next post: A Pressing Need!